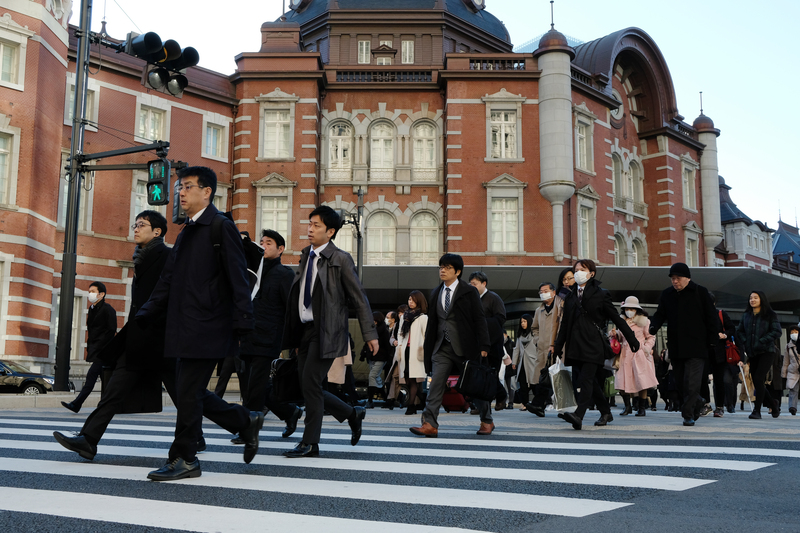 The unemployment rate in Japan fell to the lowest level in 26 years in 2018, as businesses sought to hire more workers amid a deepening labor shortage, government data showed Friday. The average jobless rate stood at 2.4 percent, down 0.4 percentage point from the previous year and the lowest figure since 1992, according to the Ministry of Internal Affairs and Communications. The number of unemployed fell by 240,000 to 1.66 million, the ninth consecutive year of decline. 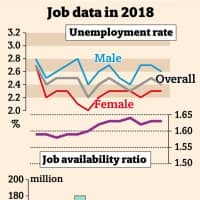 The world’s third-largest economy added 1.34 million jobs, bringing the number of people in work to 66.64 million, the most since comparable data became available in 1953. Many of those jobs were filled by elderly people and women in part-time positions, with notable growth in the hotel and food service industries, a ministry official told a news briefing. “Labor market conditions continue to show solid improvement,” the official said. Job availability during 2018 was the second highest on record, with the ratio of openings to job seekers standing at 1.61, behind the 1.76 logged in 1973 at the tail-end of the postwar economic boom, according to the Ministry of Health, Labor and Welfare. For December, the unemployment rate was 2.4 percent, down 0.1 percentage point from the previous month for the first improvement in three months. Koya Miyamae, an economist at SMBC Nikko Securities Inc., said the rate is likely to remain near this level for some time, with the likelihood of a further drop hampered by the difficulty of matching hopeful workers with positions that would satisfy them. Despite the tight labor market, companies have been reluctant to raise wages so they can keep fixed costs low, preventing households from increasing spending. 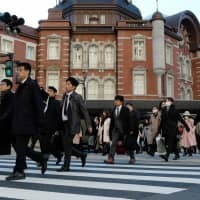 That has prevented inflation from rising to 2 percent, the target set by the Bank of Japan, which last month decided to maintain its ultralow interest rates. The economy shed a seasonally-adjusted 450,000 workers during December, with the number of people holding jobs standing at 66.68 million. The number of unemployed fell by 60,000 from the previous month to 1.67 million. Among working-age people between 15 and 64, 77.0 percent held jobs. Within that age group, 84.3 percent of men and 69.6 percent of women were working.